Where to Go in Search of Tigers in India? A tiger is indisputably the most celebrated asset of India. Many wildlife lovers must have grown up reading or listening to appealing tales of tigers and had a desire to spot it from a close distance while for a few just cite of a tiger beckon warm memoirs. Do you have a desire to witness an enigmatic tiger? India’s famous national parks are the destinations to be. It boasts of 25 tiger reserves with 1400 mysterious big cats left in the wilderness of the forests. 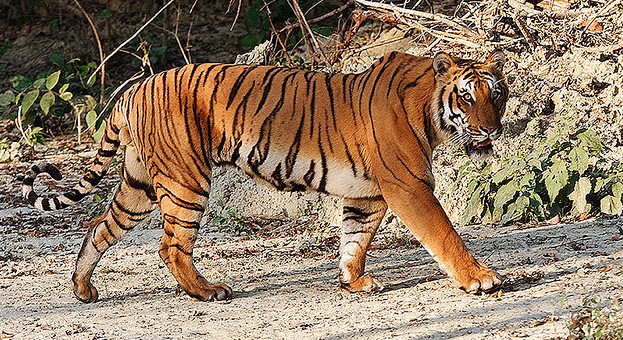 Travellers increase their chances of spotting tigers by planning a tour to the most renowned national parks of India including Ranthambore, Bandhavgarh, Corbett, Kanha, Sunderban and Tadova. It is worth journeying to atleast two or three tiger reserves while on a short tour to India. Let’s take a sneak peek into some of the most excellent ones, bestowing you goosebumps and breathtaking experience to cherish forever. One of the leading national parks of India, Ranthambore is the implausible site to witness tigers in their natural habitats. It is a dwelling of a wide array of wildlife species besides a huge population of tigers, which charm the tourists the most on their tour. The park offers a quaint environment with undulating grasslands, lovely hills, beautiful ravines and open scrubs that will undoubtedly render one with an invigorating verve. All in all it is worth a visit. Created in 1936, Jim Corbett national park is the much sought after reserves of India, which welcomes thousands of travelers every year. It is nestled amid the verdant greenery and rough hills in Nanital district in the beautiful state of Uttarakhand. The main appeal of the Corbett is its royal sight of big cat (tiger) with all its rowdiness in the premises of the park. It is a retreat for everyone, be it wildlife enthusiasts, nature lovers or ornithologists. Having more than 580 sorts of bird species and over 50 species of mammals, Corbett is one such place that shouldn’t be given a miss. Attained eminence in the traveler map of India, Bandhavgarh National Park is perched in the Umaria district in Madhya Pradesh with a total area of 446 square kilometers. It is famous for the utmost tiger population in India. Enhanced with emerald beauty, it is an ideal place for those who are stimulated with eco-tourism. Some of the other animals that can be found here are Wild Boar, Indian Fox, Indian Brison, Sambar Deer and Four-Horned Antelope. The park that boosts your odds of seeing the tigers is none other than the very famous “Tadoba National Park”, positioned at an altitude of 200 m in Chandrapur town, Maharashtra. It is an abode of more than 50 tigers making the place a paradise for wildlife aficionados. In addition to tiger spotting, there are many other different species including Barking Deer, Doles, Lions, Indian Bisons and Jackals. The park houses more than 180 species of birds also, which include native, endangered and migratory birds. Having noteworthy density of royal Bengal tigers, Kanha National Park is well known for showcasing the splendid face of flora and fauna in India. Its undulating grasslands, Sal forests, beautiful gorges, grassy meadows and magnificent sights of enchanting wonders fascinate the travelers a lot during their tour. It is also a domicile of many other wild creatures such as Mouse Deer, Leopard, Common Langur, Striped Hyena and Black Buck. One can also relish the elephant safari to experience the true wilderness of the jungle. Proclaimed as a biosphere reserve in 1989 and in 1973 as a tiger reserve, Sunderban National Park is a chief mangrove jungle in the globe. It has become a home of over 200 tigers, which have built up an inimitable feature of swimming in the salty water. Those species which have been announced as endangered are living secured in the premise of the park, encompassing King Crabs, Batagur Baska, turtle and royal Bengal tiger. It tenders an amazing vista and an adventurous trip for a lifetime to evoke.